I reported on the favourite reading oriented sites in the middle of February. 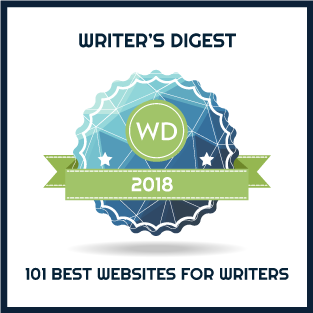 Today’s post looks at the list of sites by category: reading sites, social media, retailers, blogs dedicated to historical fiction, genre sites, general book review blogs, author sites, industry sites and so on. The variety of this ‘reading ecosystem’ is phenomenal. With my friend Excel at my side, I’ve gone through all named sites (696 in total) and classified them. Admittedly, this is my own classification scheme but I think it has merit. 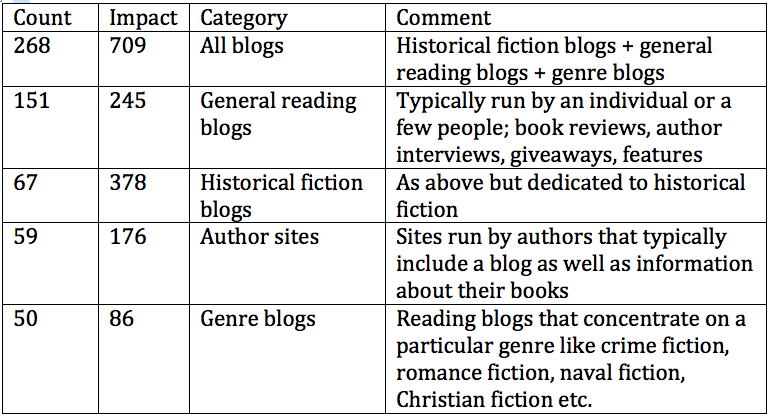 As you can see in the All blogs category, blogs are a favourite vehicle to share book reviews and other book related information. 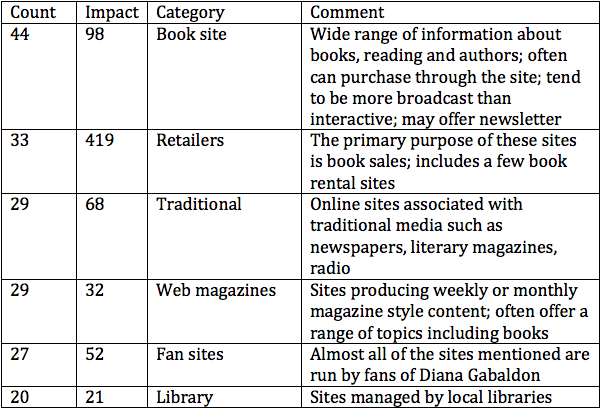 Count refers to the number of different sites mentioned while Impact is the total mentions for that category. For example, a blog like Reading the Past is only counted once in the Count column, but given that 47 people included it as a favourite, 47 is added into the Impact total. In the next group, we can see the role retailers play. Amazon accounts for 306 of the 419 Impact total. A final group includes social media and reading sites like Goodreads. 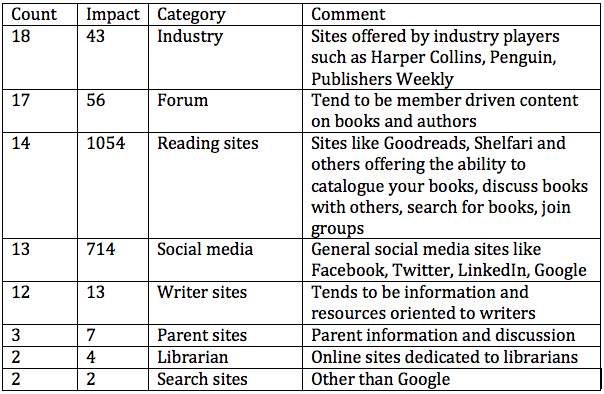 If we group reading sites with social media, the total impact score is 1768. After cleansing the data as much as I could, 696 different sites remained of which 500 were mentioned by only one person. In 106 cases, the survey participant was insufficiently specific for me to categorize his or her entry. What’s of most interest to me is YOUR thoughts on what all this means for readers and writers. Really interesting findings as always, Mary. I think I tend to underestimate the power of blogs (well, mine anyway!) but clearly they are so important to reach readers. I think you’re right, Elaine. And they are important to those readers who create and manage them. There’s something very special about reading! This is not meant to diminish your hard work, but I think a statistician would say this data is skewed because the survey was disseminated through a blog. So it was self-selecting in its respondents. That would make blogs score much more highly in the results than if it was a true random sampling of the reading population. Therefore, I’m not sure readers and writers can draw any useful conclusions from this data. Thanks for your comment, Ruth. I’ll stir that consideration into the mix as I do more thinking! These results reinforce an even less scientifically valid survey a few of us indie authors did recently via Facebook posts. We asked where people got their next book read recommendation. The top response was “word of mouth,” though word of mouth had a broad definition, from traditional “mouths” such as booksellers, librarians, and the friend next door to the newer “mouths,” of social media, including blogs. Thanks for doing the work of digging further into your survey results, Mary. Love that definition of ‘word of mouth’, Carol. While I appreciate Ruth’s perspective and the need to take care with interpretation, I believe the data offers an intriguing look at today’s world of reading.